Wireless audio products have never been more accessible for consumers. We’ve introduced a lot of cheap wireless headphones that cost less than a pizza. Today, we’re checking out a wireless speaker with all the features you’d ever need, the Leeron Bluetooth Outdoor Speaker. The product has a simple box with just the speaker, a carabiner, a microUSB cable and an AUX cable inside. The Leeron speaker features a weird shape that doesn’t look like any other. It is tapered in the middle and looks a lot sportier than cylindrical speakers on the market. It can’t stand vertically because the 2 sides are uneven. You can even find a loop on the right side to be attached to the included carabiner. When you place the speaker on the table, you can see that it is angled upwards slightly to project the sound directly to your ears. I’m quite impressed with the build quality of this speaker. It feels solid and unbreakable, especially with the thick TPU rubber material covering most of the exterior. The only non-rubbery part is the front aluminum grill. 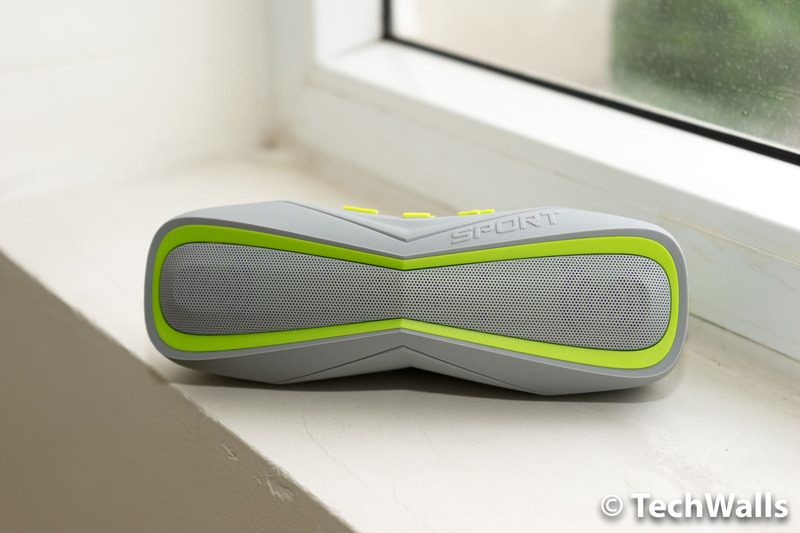 This is not simply a tough speaker, it is also IPX7 waterproof. All the buttons are also made of rubber and they are placed on top of the speaker. Connection ports are located on the back but you will have to open the thick rubber flap to see them, you will find the microUSB port, a 3.5mm audio port, and a microSD card reader. 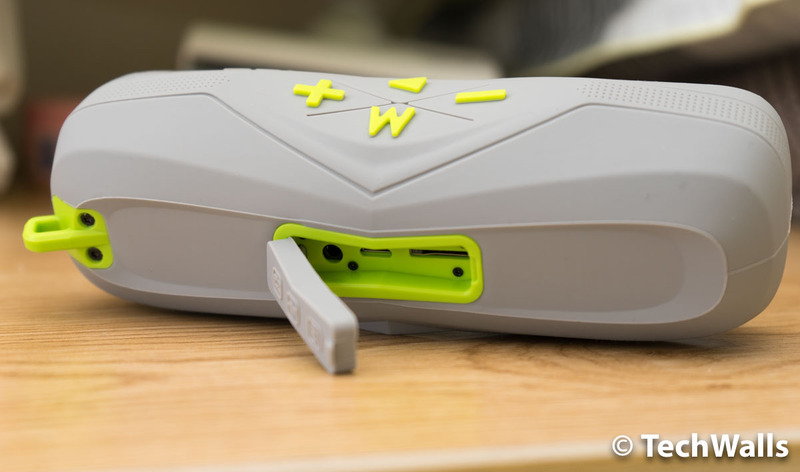 The speaker is powered by an 1800 mAh lithium-ion battery. It is said to last up to 9 hours but the battery often dies in just about 6 hours in my test. The battery life is average as some of my wireless speakers could last up to 20 hours. The Bluetooth range of the Leeron is quite good. Basically, I can put my phone in one room and use the speaker in the room next to it. 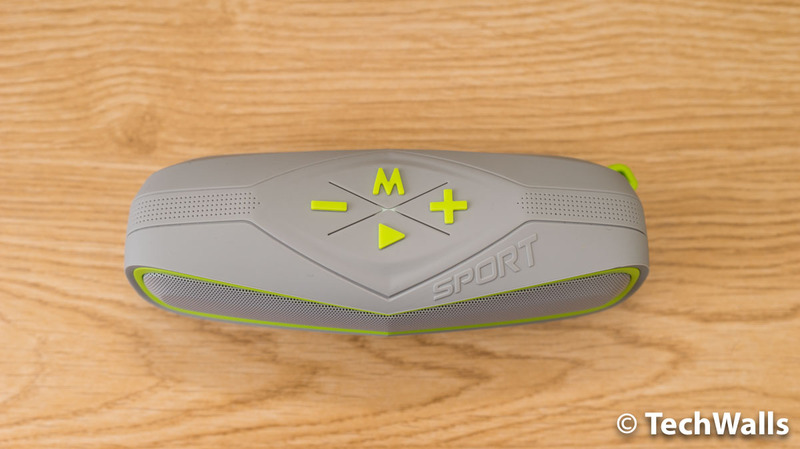 The speaker has the same issue as most other waterproof speakers on the market. It produces a muffled sound and lacks depth. The sound is not clear and bright, therefore, it falls short as compared to some other speakers at the same size. You can see this video comparing the sound between the Leeron and Creative MUVO 2. Apart from the boxy sound, the Leeron is acceptable in mids and I can hear the existence of the lower mids. The bass is there but it is not enough to rock your small room. Besides, I also won’t recommend you to crank up the volume as the sound will start distorting. It seems like the speaker is more suitable for watching Youtube or movies, rather than for enjoying music. It sounds just a little better than my old table top radio. However, you shouldn’t ask much from such a cheap wireless speaker. The Leeron is obviously not the best-sounding wireless speaker but it is among the most affordable waterproof wireless speakers on the market. I recommend the product if you’re looking for a cheap rugged Bluetooth speaker that can endure tough weather conditions. Yeah, this bluetooth speaker is value for money. $25.99 with code XRHHI89L at amazon us now, end 12/31/2016.